Precisely formulated to support the healthy growth and development of newborn kittens. 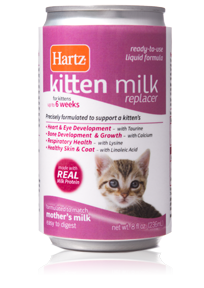 Packed with essential nutrients, Hartz® Kitten Milk Replacer formulas support healthy growth and development during the formative first 6 weeks of a pet’s life. Formulas are also suitable as a supplement for pregnant, nursing, or convalescing cats. Available in powdered and ready-to-use liquid.